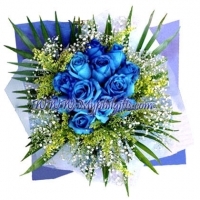 One blue rose is captivating; 12 in one bouquet is enough to render a person awestruck and speechless. 12 Blue Roses Hand Bouquet. Same day delivery is not possible for Ecuadorian roses, we advised to complete order 7-8 days ahead of delivery date for imported roses. Our shipping charge is $7 nationwide.